Earlier this month Elon Musk's SpaceX successfully launched Falcon Heavy, the company's most powerful rocket yet. Inside was a red Tesla Roadster sports car with built-in cameras for capturing what it sees as well as a copy of Isaac Asimov's science fiction book series Foundation, and a plane engraved with 6,000 SpaceX employee names. The car's destination: Mars. So, what does the road to Mars actually look like? One space enthusiast has created a website for tracking the car's journey using NASA data to track the Roadster's course. Aptly named Where Is Roadster? The site offers real-time data on where the Roadster currently is as well as an interactive tool to help you see where it's headed as well. As it turns out, the car isn't making a beeline right for the Red Planet. Like all other things, it has to deal with the force of gravity working against it, which means that instead of going straight for Mars, it's instead travelling in a bit of an arc. 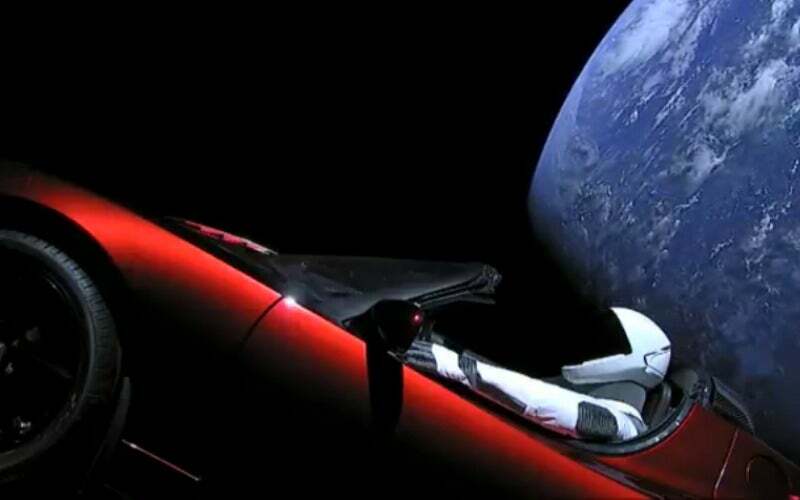 Right now, the roadster and its passenger, a dummy named Starman, are roughly 2.25 million miles away from Earth and 137.5 million miles away from Mars. It's not expected to reach its destination until October 2020. And bad news for Starman if he runs into trouble along the way: The car exceeded its 57,936km warranty 636 times while driving around the sun.